Handmade gifts, crafted with tender love and care, can be the most meaningful gifts to give—you can customize them specifically for the individuals you are giving them to, while also adding unique touches that can only come from you. With some time to spare before Christmas, make your loved ones something that’s one of a kind—just like them! We’ve got three amazing gift ideas you can try out this holiday season. You’ll definitely want to check this list twice! We sure love feminine artwork (the hearts, the flowers, THE GLITTER! ), but papercrafting can certainly cater to the men in your life, too! And is it just us, or are they also some of the hardest people to shop for? Look at this shadow box that’s “reel” perfect for your husband, father, son, or brother to hang in their favorite space. ☺ The Urban paper packet and its coordinating Complements make “masculine” papercrafting a breeze. 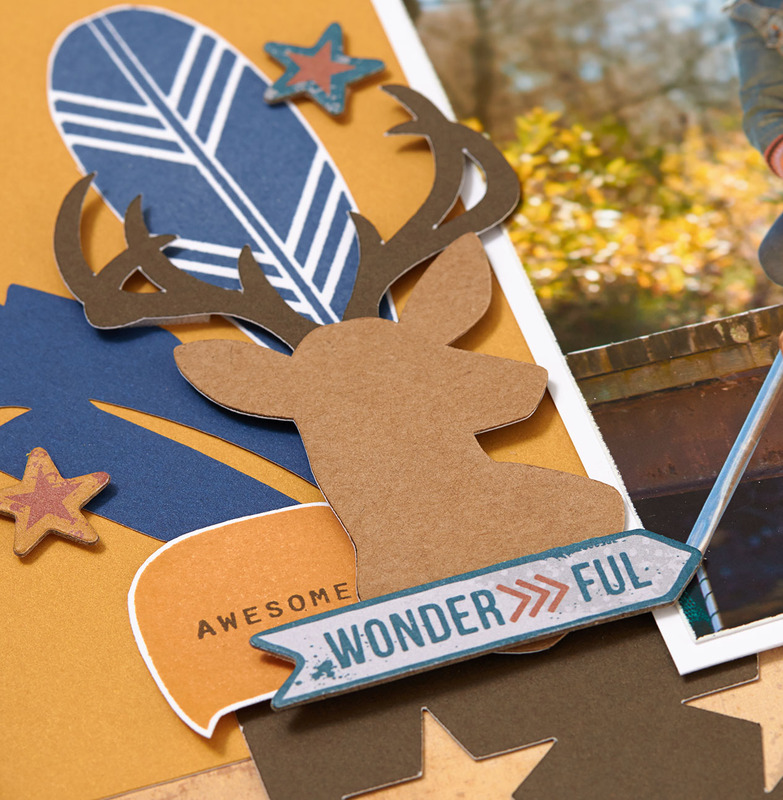 If your guy is the outdoorsy type, try using fun accents, like this deer head, from the Cricut® Artistry collection. With a new year right around the corner, Christmas is the perfect time to give someone a handmade calendar—and everyone needs a calendar, right? Our My Creations™ calendar gives you the chance to create a gift that is useful, personalized, and absolutely stunning! In our example above, we filled the top section with a beautiful quote (stamped with the My Acrylix® Handwritten Print stamp set), and surrounded it with some beautiful stamped flowers. You could also fill this 12″ x 12″ space with photos, papers, embellishments, and any artistic decorations you want in order to give a gift with a truly personal touch. Stamping definitely comes in handy when filling out the calendar portion, both for creating monthly titles and for stamping the numbers in the boxes. That’s what’s great about this calendar—it’s a blank canvas, and you’re the artist extraordinaire! We all know someone—a mother, grandmother, or friend—who doesn’t need a special occasion to send thoughtful letters to others. Wouldn’t this person love to have beautiful personalized stationery to do just that? With some simple stamping, gold glitter paper, and our My Creations™ journaling cards box, you can create a beautiful stash of stationary for the letter writer in your life. Which gift idea are you most excited about? Tell us below! Your loved ones deserve the best, so turn on the Christmas music, and put on your Santa hat: It’s time to become a crafting elf!